Spotted these flip-flops back in March at one of the rest stops on the AC Expressway. I could not believe that some person/company actually made them and someone actually bought paid $22.00 for them. Whats your opinion? Would you wear them? These are, in my opinion, always off-season. Posted on June 13, 2015, in Quotes of the Day and tagged Blog, challenge, Dreams, fun, new jersey, nj, Photo, photo challenge, photography, photos, Pics, Pictures, plants, shoe, Sony @65, WP PHOTO CHALLENGE. Bookmark the permalink. 36 Comments. 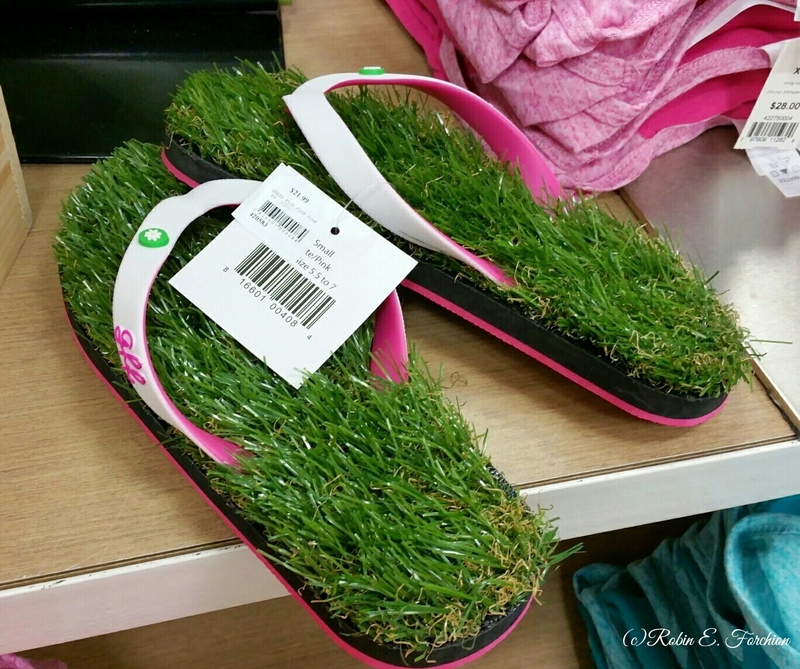 Yes they are expensive for plastic flip-flops and fake grass. I applaud the designers creativity but I don’t understand it. I could not wear them. They are different if nothing else. Ha ha! I need a pair of those. Always be grounded. Thanks a good way of looking at it! Looks like the grass can grow under your feet. Those redefine hideous! I nominated you for the 3 Days, 3 Quotes Challenge! I hope you are able to participate. Are they soft? They will tickle my feet. It was a bit soft. Just weird looking. El nutso. No thanks!! I couldn’t even imagine how terrible that would feel on my feet. Ugh!! 22 bucks!? We’re in the wrong business you and I! We are definately in the wrong business. It probably only cost 1 (if that) to make. That would be a heck of a profit. What can our brilliant minds come up with? Er… I’ll get back to you with a business plan. Before 2020! LOL must be a very adventerous person…you are among the few that would wear them. I agree $22 is a bit much for these..
Reblogged this on Your Nibbled News. Thank you Gerry!!! They had a few of them for sale. I am sure they are selling fast as it makes for a great converstion piece. I doubt it. Thanks for the vise.